Jason Voorhees of Camp Crystal Lake will sit out this Friday the 13th due to a pulled hamstring. 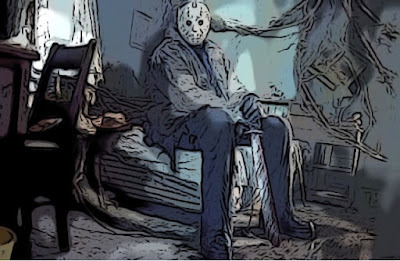 The veteran slasher psycho got hurt in a death match against Michael Meyers on Halloween, where both were killed and both revitalized, but when Voorhees got back up yesterday, he got up in major pain. After an MRI late in the evening, reports concluded that the machete maniac would have to take it easy for the next seven to 10 days. Campers who have booked trips to Camp Crystal Lake for the weekend have been tweeting about their disappointment. Some have cancelled their visits, claiming it would be no fun without an evil force toting random death tools on their tails. Voorhees is more than bummed. He told reporters he'd most likely stay in bed and watch cartoons.